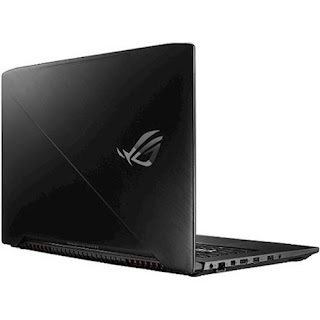 The ASUS ROG STRIX GL503VDDB74 is a laptop PC comes packed with 7th Generation Intel Core i7-7700HQ powerful quad core SoC that features 6 MB level 3 cache and runs at the base clock speed of 2.8GHz with Boost speed up to 3.8 GHz. It supports Hyper Threading technology to be able to process up to 8 threads at once. It has a dedicated GPU called NVIDIA GeForce GTX 1050 graphics ehich is equipped with 4GB dedicated video memory. 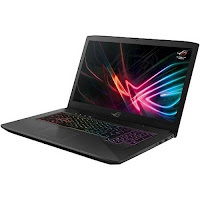 The ASUS ROG STRIX GL503VDDB74 laptop PC is equipped with 16GB system memory for intense multitasking and gaming; 1TB hard drive and 256GB solid state drive (SSD) for a blend of storage space and speed; SD and MultiMediaCard memory card reader; backlit keyboard for easy typing in dim or dark locations - built-in 10-key numeric keypad to quickly input numbers; Aura RGB illumination technology that allows users to create customized and zoned illumination schemes; HD webcam with array microphone; N-key rollover and anti-ghosting technologies to ensure that inputs are tracked precisely, no matter how many keys are pressed at once; Smart amplifier technology that delivers louder in-game audio up to 200% higher volume and minimizes distortion to ensure smooth operation; and a 4-cell battery to be able to use this laptop whenever you are away from the main source of electricity. It comes in ROG Metallic Black for stylish look. With regards to connectivity, this laptop comes packed with Bluetooth 4.1 interface syncs with compatible devices; 1 USB Type-C port; 3 USB 3.0 ports maximize the latest high-speed devices; 1 USB 2.0 port to connect more accessories and peripherals; HDMI output expands your viewing options; and Next-Gen Wireless-AC connectivity. This ASUS ROG STRIX GL503VDDB74 is powered by Windows 10 operating system. This laptop has the following dimensions: 0.9 inches x 15.1 inches x 10.3 inches and weighs about 5.1 pounds. You can get this laptop PC at the price of $1299.99. Other laptop in this price range includes ASUS VIVOBOOK PRO 15 N580VDDB74T; ACER SWIFT 7 SF71351M51W; and MICROSOFT SURFACE D9P-00001. Do you own this laptop computer. Please let us know your experiences with this device.